Having missed the opportunity of attending the Tesco 20th Anniversary and Tesco 25th Anniversary festivals, it was high time for me to make a special trip to Germany in 2017 to attend Tesco’s 30th Anniversary festival. 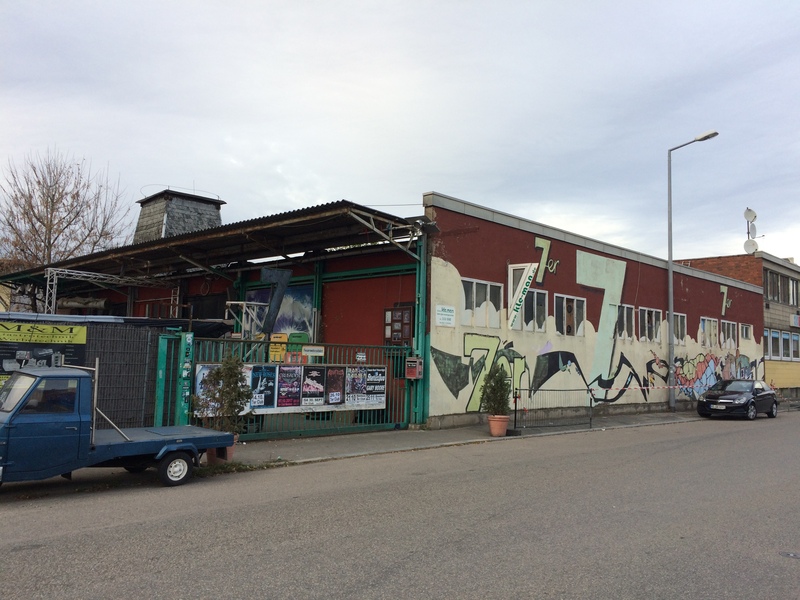 Thus faced with a 26 hour journey from Australia, I made my plans to arrive in Mannheim (aka German industrial/power electronics ground zero) on the Thursday morning, with a view to getting over the worst of potential jet lag before Day 1 on the Friday. As with the Tesco 20th & 25th Anniversary festivals, the Tesco 30th event was hosted at the 7er Club, located on Industrialstrasse (Industrial Street), in an industrial estate around 2km to the north-west of the city centre, and based on both the street name and location, it was all rather apt for what the assembled 400+ crowd was going to bear witness to over the course of two nights. As for the venue, it constituted a large open warehouse/ rectangular hall type space, featuring an elevated stage to the front with extensive professional lighting and PA rig, and a bar area to the back. 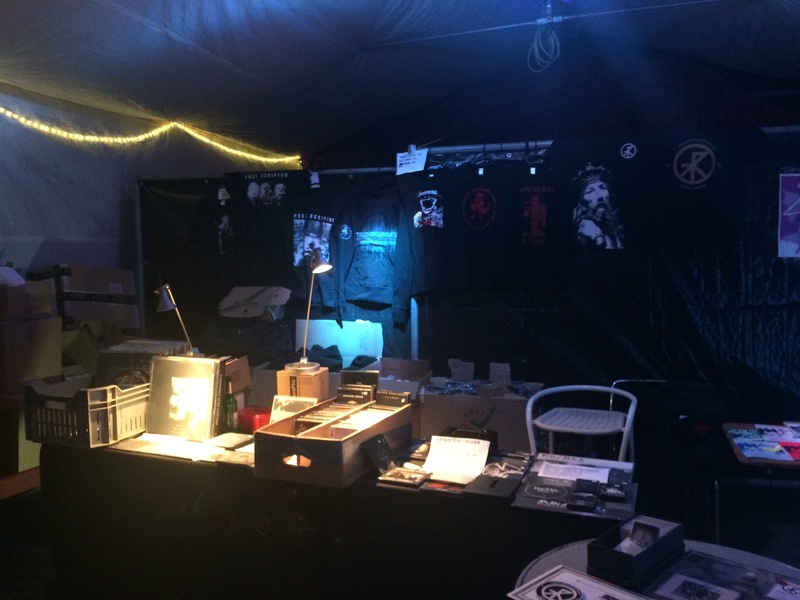 In addition an open beer garden was located to the side of the building, which for the duration of the festival accommodated the merchandise tent and chill out area. 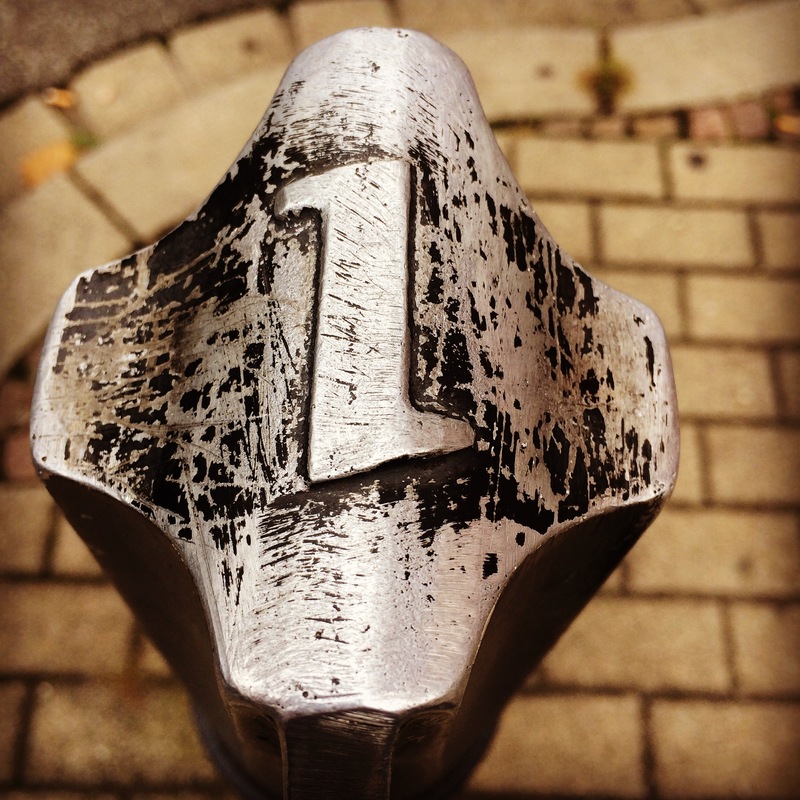 Overall it is an event space which is rugged but clearly functional and fit for purpose. With myself arriving at the venue a few hours early before official opening, it provided opportunity to set up my Noise Receptor Journal merchandise stall and catch up with old and new contacts alike, and generally taking in the vibe of the space in a more relaxed way before the venue was to open. However on the basis of Tesco Organisation announcing in the days before that exclusive merchandise would be made available (including a new Genocide Organ 7”EP, a new Genocide Organ t-shirt and a new Ke-Hil 12”EP), when the gates were officially opened the merchandise tent was quickly swamped with fans clambering for the limited Tesco items, as well as merchandise from Alfarmania, Proiekt Hat, Styggelse, Unrest Productions, Contrastate, Trepaneringsritualen and yours truly. But with doors opening at 7.30pm, and with the first act on at around 9pm, it at least provided ample time for attendees to make their purchases and settle in. 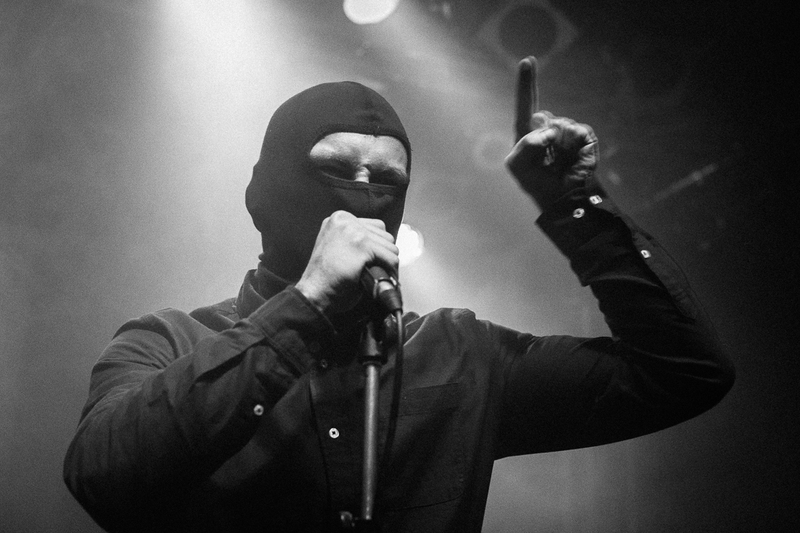 With the relative newcomers Kevlar being given the opportunity to open the festival, they demonstrated their honed approach of taking elements of classic power/ heavy electronics, and twisting this into a massive strike of modern militancy. 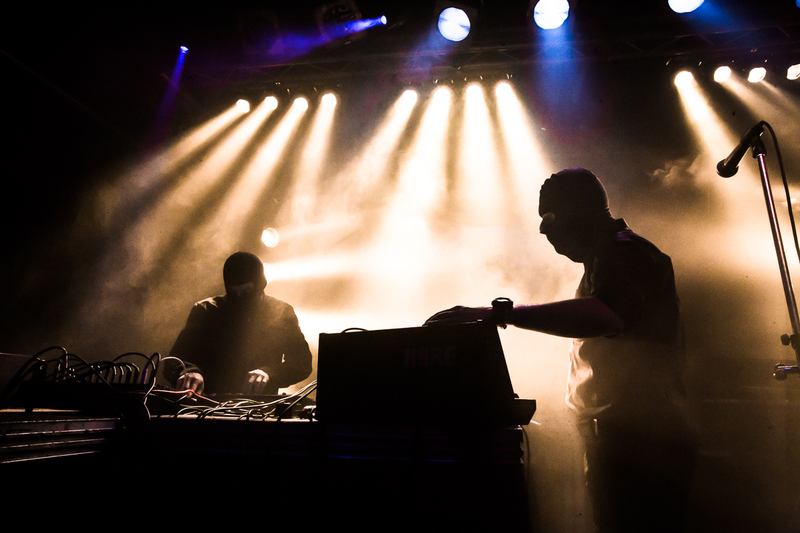 As a duo, the two black clad and balaclava wearing members blazed through a bristling set of heavily layered and meticulously constructed tracks based around machine gun like chattering distortion and waves of pumping bass. 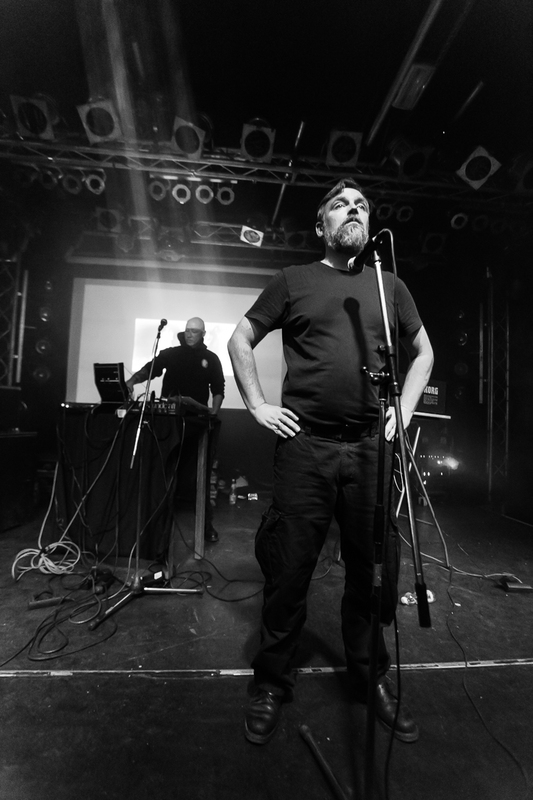 With a setup consisting of Korg synth and effects units, the duo took separate turns on the flanged vocal attack, which was performed against to a looped background video of black and white riot footage and snarling dogs etc. which was very effective in setting tone and mood. 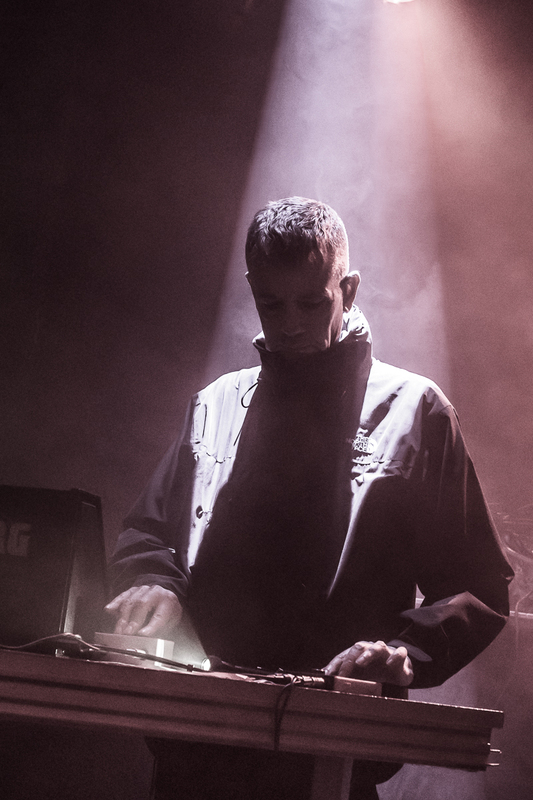 Essentially taking the hallmark elements of 90’s German/UK power/ heavy electronics, but further twisting it to their own devices, Kevlar delivered a commanding and sophisticated opening slot. 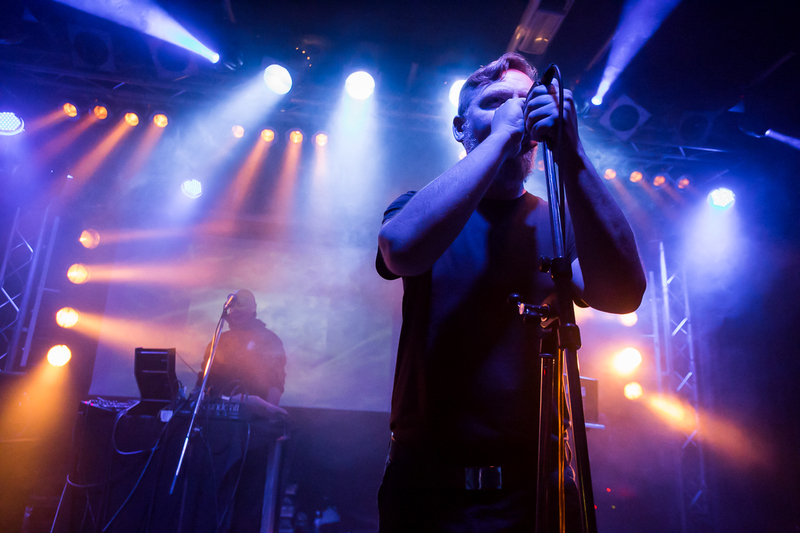 Apart from the high calibre sonics and visuals, both members demonstrated differing but equally charismatic stage presence, while the title track of the their recent New Fears New Fights and Power of Blade being notable highlights. 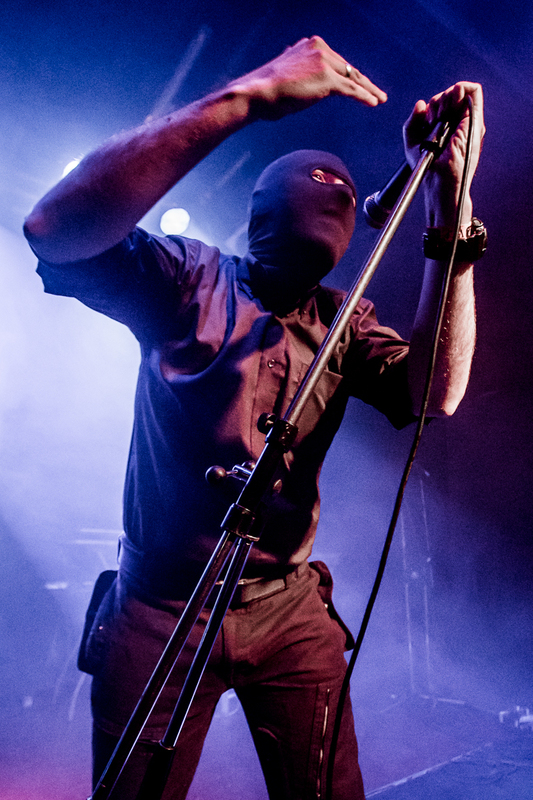 The pairing of Alfarmania and Proiekt Hat were up next to follow the direct sonic strike of Kevlar, but differed substantially given their chosen morbid ‘post-mortem’ sonic paths. 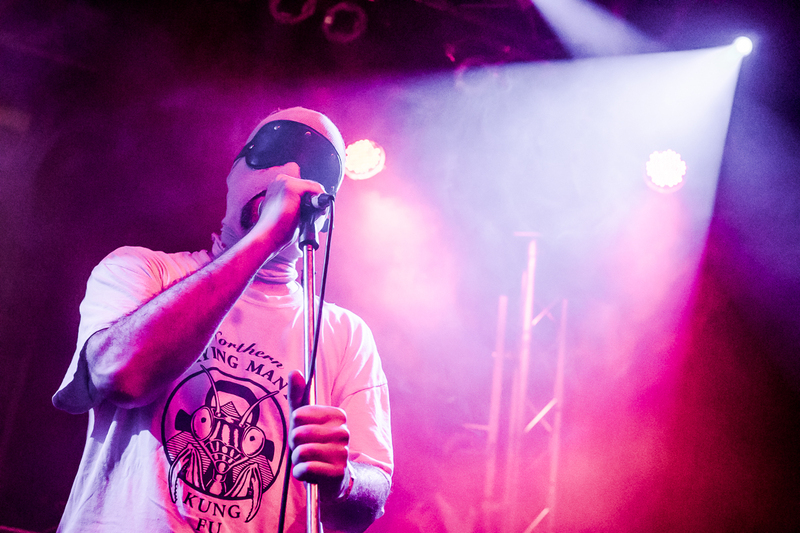 Standing behind a long table of spartan synth gear, Mr Proiekt Hat was disguised with a paintball face mask, while Mr Alfarmania wore a skull mask to visually illustrate intent. 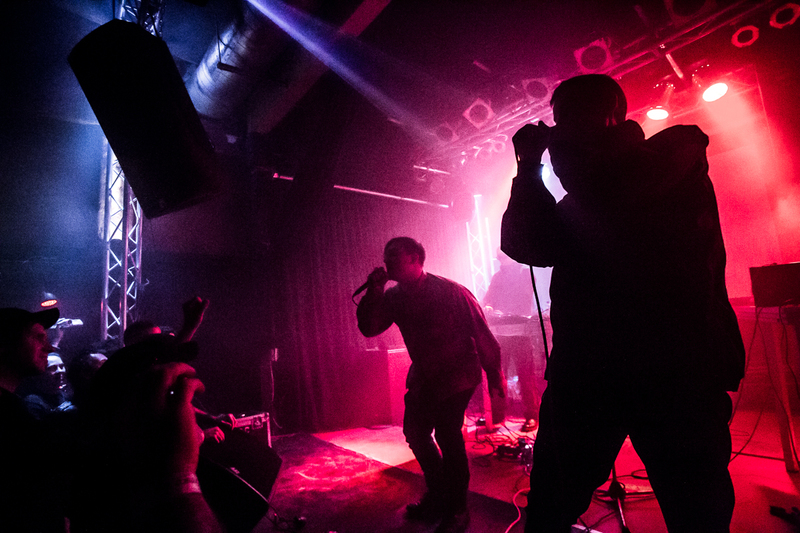 From the immediate get go, the duo quickly pulled the crowd into a downward spiraling vortex of heavily negative vibes, but done in a completely controlled and considered way. Being something of an audial expression of a bad LSD trip, this impression was reinforced by the at time hallucinogenic video backdrop which ranged from wormhole spirals spliced together with a slide show of images ruminating on death and general darker/ occult obsessions. With the duo working in complete unison and with little or no communication throughout, it was a roiling intense ride of insidious sonic qualities. 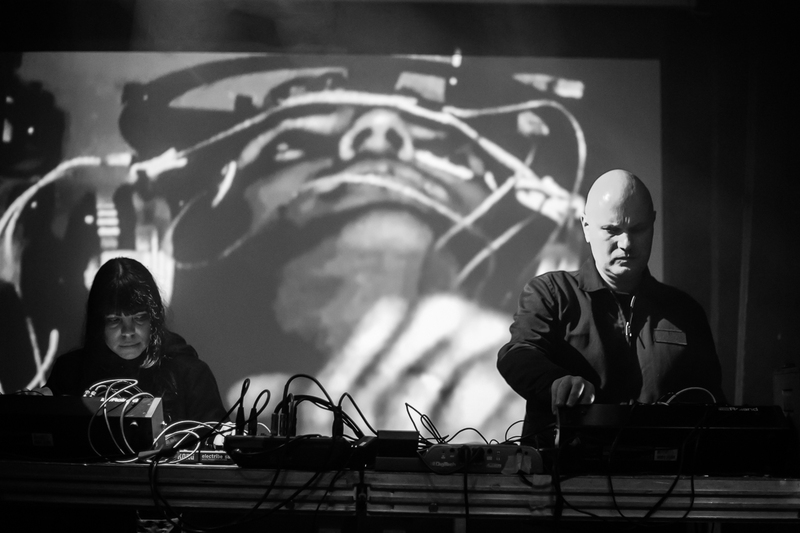 Perhaps differing slightly from their usual material given the overt rhythmic focus (being at times quite pulsing with a wonky and queasy sonic quality), the darkly hypnotic set from the duo could be best described as something like ‘pulsing emanations from the void’. The third act on the bill was the long standing and rather unique UK trio Constrastate and perhaps sonically they were the odd ones out on the bill, but their inclusion was justified by the fact they have a history which extends back to the earliest days of Tesco Organisation. 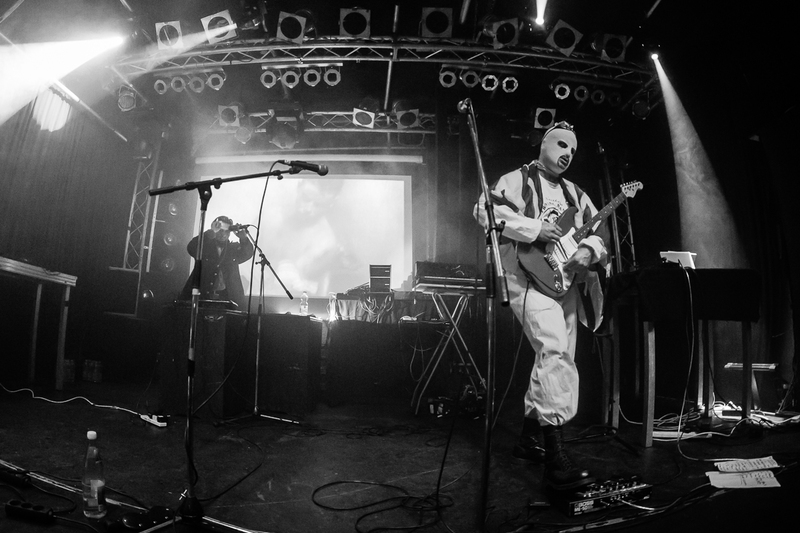 Given the sound of Constrstate has itself always been individualist blend of ambient and experimental soundscapes coupled with a strong performance art aspect, which was reinforced on the night with the lead member clad fully in white (including jumpsuit and balaclava) and further draped in an English flag. With the front man wielding a guitar (but never playing this in ‘usual’ fashion), the other two members were stationed at the back with tables of varied sonic equipment. 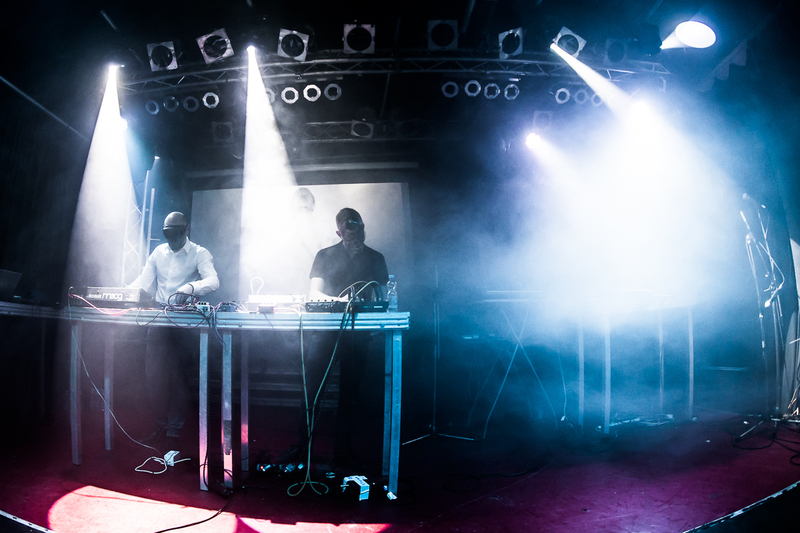 After launching into their first track, quite early on the group battled some significant sound issues (some sort of earthing issue created static feedback), which resulted in them needing to stop the show twice and reboot the set. But the trio took this setback in their stride with a degree of humour, and the issue was isolated and overcome, they got down to delivering a set which only Contrastate could. 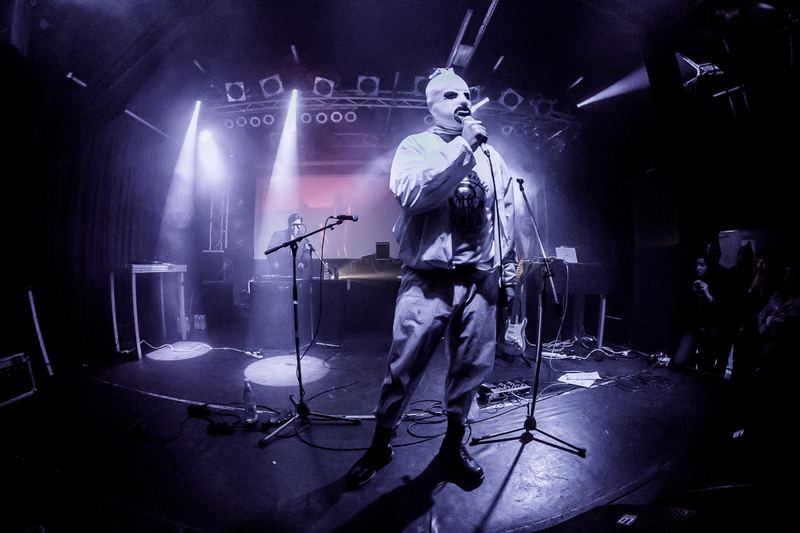 In terms of the front man’s stage presence it straddled a fine line between the ridiculous (i.e., appearance) and sincere (i.e., darkly poetic spoken vocals delivered with a sense of urgency), which was set to their surreal, sprawling experimental droning soundscapes which on occasion pushed into harsher pounding territory. With a dedicated and sincere performance it was an enjoyable set, and all the better that the early sound issues were overcome and did not through off the focus of the performance, and a personal highlight was the shimmering abstract melancholic drones of Breaking the Strawmen from 1992’s A Live Coal Under The Ashes. After an extended wait, the headline act Anenzephalia finally took to the stage, and given the project has been on extended hiatus, they were enthusiastically welcomed to the stage by the capacity audience. 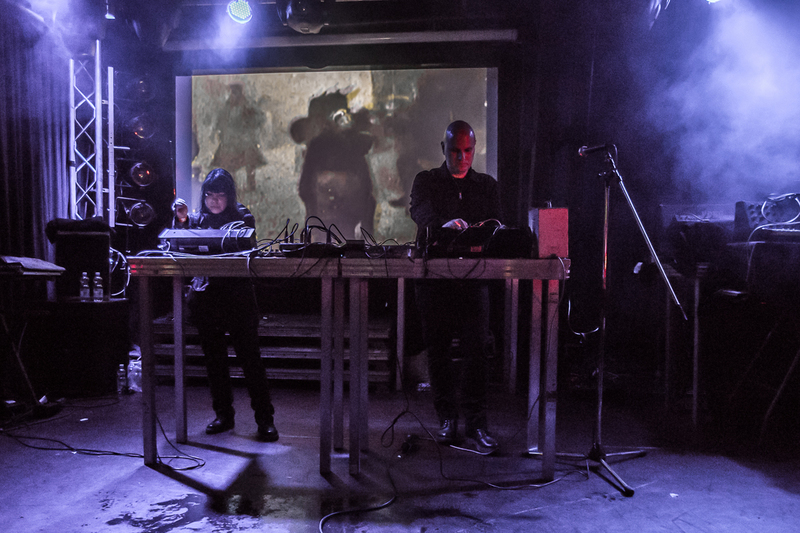 At the commencement of the show with the duo of Brigant Moloch and Wilhelm Herich positioned to either side of the stage with separate tables of equipment, however soon Brigant Moloch was stationed up front on vocals and Wilhelm Herich up the back controlling the barrages of minimally structured but brutally loud waves of distortion in the heavy electronics style the group are known and lauded for. 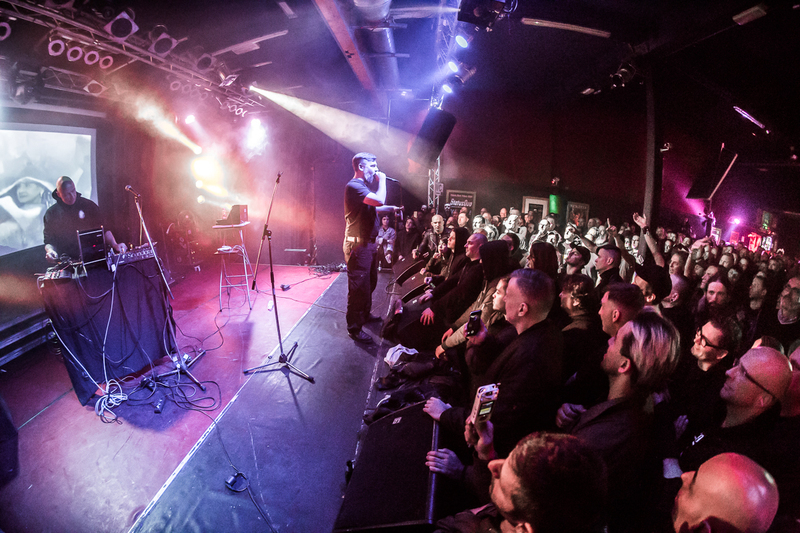 As the Friday night headliner it appeared they had benefit of being able to use the PA to full capacity, given the volume was louder than the already substantially loud volume for other acts. 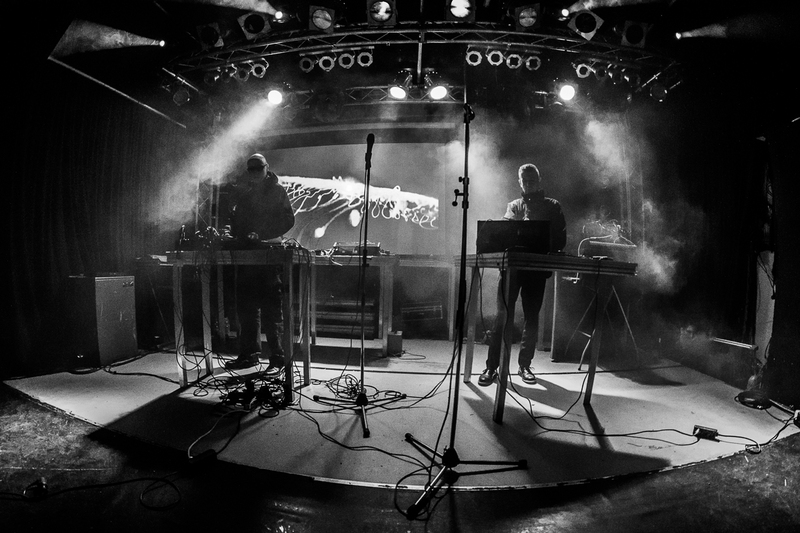 With this added sonic arsenal the duo proceeded to swamp the audience with wave after wave of cascading noise and minimalist rhythmic structures. 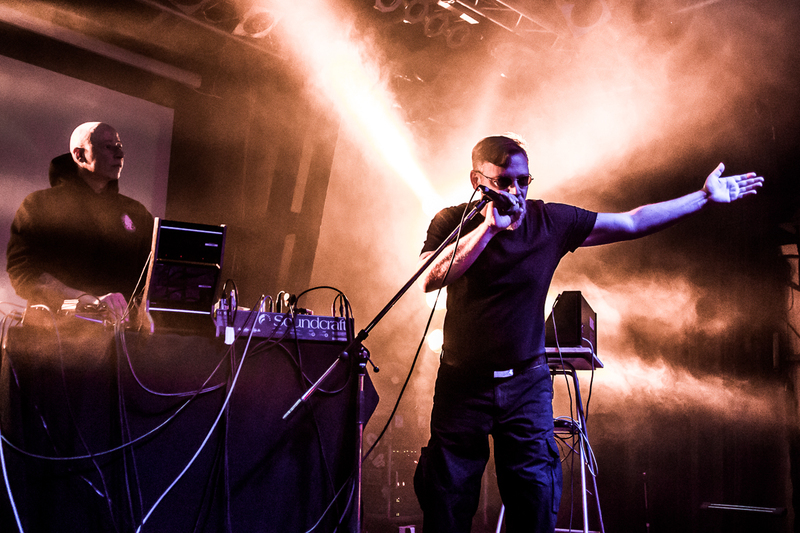 In essence the minimally structured heavy electronics in the trademark Anenzephalia style provided a massive sonic impact, while Brigant Moloch drew the crowd’s focus though his commanding stage presence being that of a dictator or ‘big-brother’ type character issuing deadpan proclamations of societal manipulation and control. Although many recognisable tracks were played (including the peerless Prozac Patrol), interestingly they were delivered in slightly less aggressive style then the direct fierceness of the originals, but equally no less sonically intense. This approach generated hypnotic tension throughout the set, which was very much enhanced by the strong blue and white lighting and video backdrop and built to a final conclusion with a massively punishing and fist pumping version of Final Pulse (…“here your dreams die” indeed). Being a much more refined and commanding performance than the one I witnessed in London in 2002, it was an extremely powerful way to conclude Day 1 of the festival and demonstrated the complete masterly of the duo on stage and by virtue of sheer intensity has the standout performance of the night. After a late night of post event drinking, Saturday was a lazy affair of sleeping in and generally getting ready for the second night’s actions. In opting to arrive early at the venue again, it provided opportunity to again chat with various performing artists and others about this and that, as well as to catch some the final soundchecks being conducted. 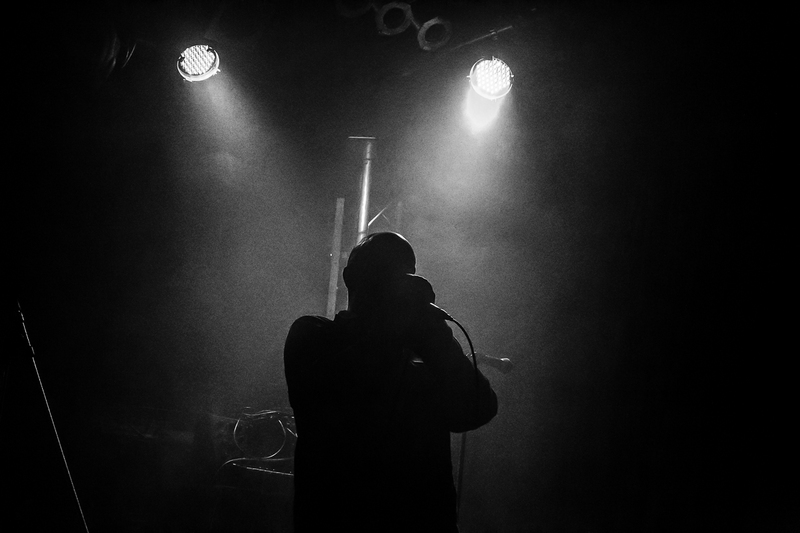 The Finnish ritual dark ambient project Zoät-Aon had the role to open Day 2, and given I was already well familiar with their two albums it was clear the show would be far more than merely some minimal laptop playback driven dark ambient snooze fest. Although the project is the solo vehicle of Jaakko Vanhala, he was assisted on stage by Antti Litmanen of Artau Eos. With Jakko manning a table of effects equipment and Antti manning a separate table with more sonic equipment in addition to gongs, symbols, bowed instrument, Tibetan brass horn, thigh bone horn, etc., the duo built highly animated, roughly detailed and textural droning soundscapes. With a heavy blanket of smoke and bathed in subtle yellow/ orange light, the group slowly built up a base of shifting textural layers, which definitely had the sense of following pre-planned and interlinking sections/ segments. 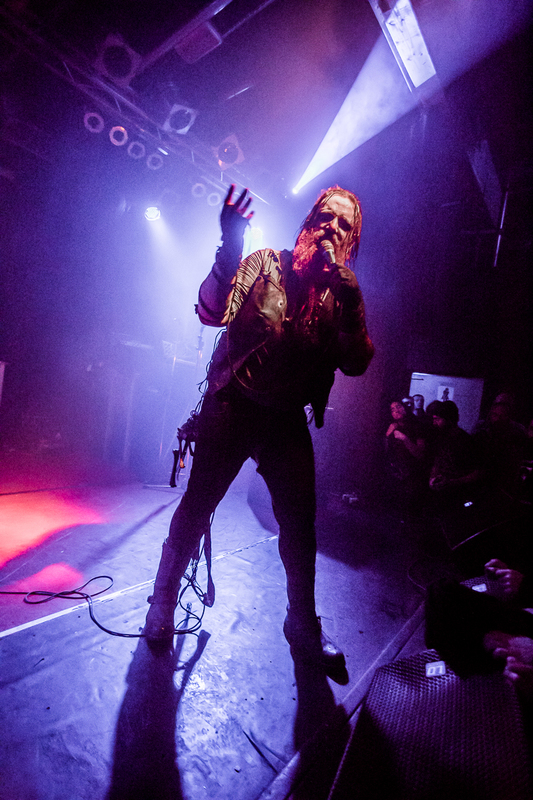 But notably things took a marked step up mid set when Jaakko delivered some heavily treated chanted type vocals and from there the set built in both momentum and enveloping engagement, and in a surprise twist the final segment delved into a squalling noise set more typical Jaako’s solo work. While I had seen this noise workout earlier in the day during soundcheck, I had assumed it was merely Jaako taking the opportunity to test out the PA, and although such sonic harshness is not typical of Zoät-Aon’s sound, Jakko expertly weaved this into the already established ritual soundscapes, and including a series of ritualised hand gestures and poses while manipulating the noise box shaker. 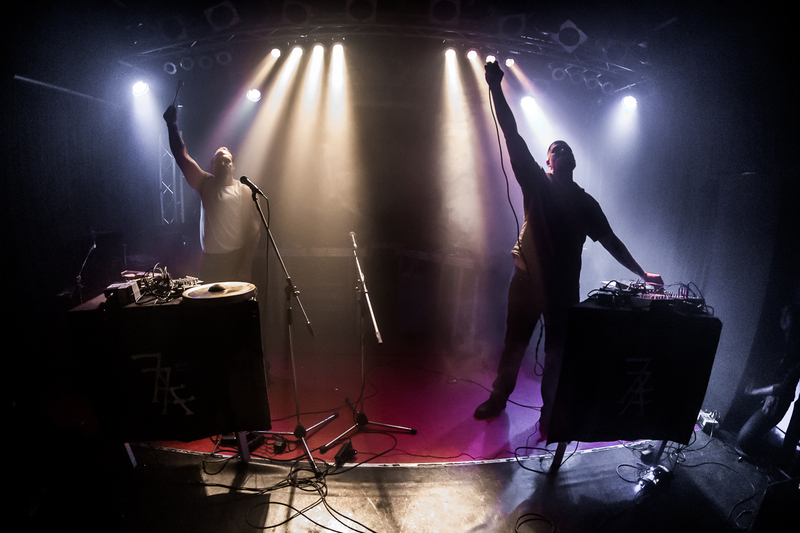 Amounting to a highly animated conclusion to a slow building set, Zoät-Aon demonstrated themselves to be another act with total mastery of their sonic craft. Having seen The Grey Wolves for the first and only time in London in June 2001, it has been a show strongly etched in my memory ever since. Now some 16 years later, this was to be the second and final time to see the group given this was announced as the final show from the group following the release of their final album Exit Strategy. 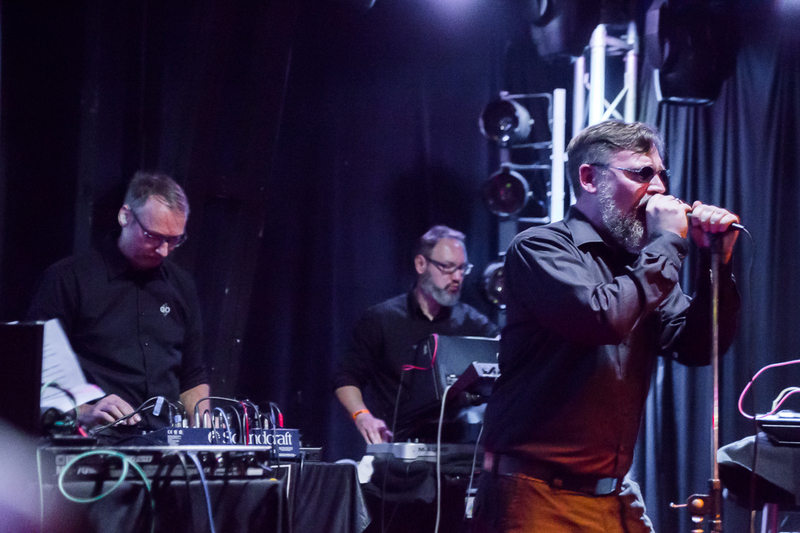 With the reclusive Trevor Ward effectively never participating in live Grey Wolves shows, most commonly Dave Padbury has been assisted on stage over the years by Mike Dando of Con-Dom, or otherwise by Wilhelm Herich of Anenzenphalia and Genocide Organ. For tonight’s final performance, Wilhelm had been recruited to fulfil the assisting sonic manipulation role. Commencing the performance with swirling textures and a Timothy Leary dialogue sample: (“Throughout human history, as our species has faced the frightening, terrorizing fact that we do not know who we are, or where we are going in this ocean of chaos, it has been the authorities, the political, the religious, the educational authorities who attempted to comfort us by giving us order, rules, regulations, informing, forming in our minds their view of reality. To think for yourself you must question authority and learn how to put yourself in a state of vulnerable, open-mindedness; chaotic, confused, vulnerability to inform yourself. Think for yourself. Question Authority”), this set the scene before launching into a set list that consisted of a mix of tracks from the new album and a few old classics thrown in for good measure. Likewise, although the set was accompanied with a visual backdrop, the previously used riot footage had been replaced with abstract morphing shapes, which was perhaps neutral to the point of being nondescript and which tended to not draw or keep attention given the physical action on stage. With Wilhelm relegated to the rear, Dave held focus to the front, but his presence was far more considered and controlled in his pacing of the stage when compared to the overt antagonism I witnessed in 2001. 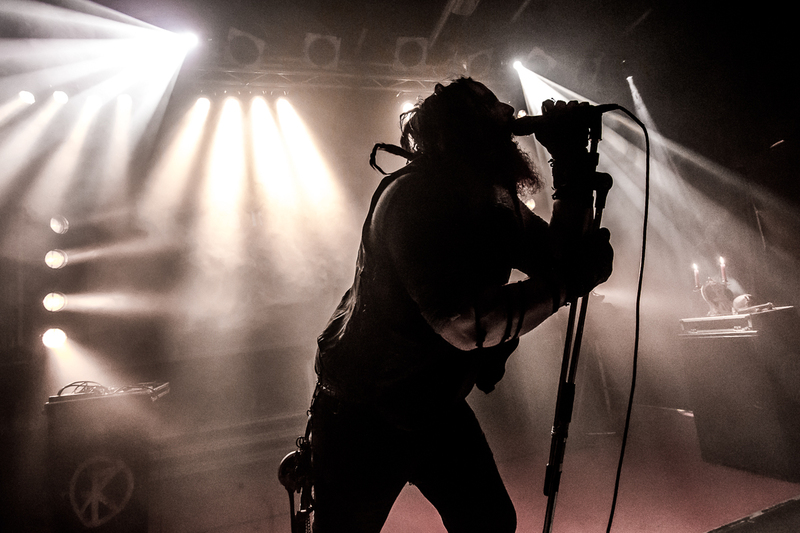 Highlights of the set came from perhaps obvious quarters, which included the night’s rendition of Religion and the punishing and lengthy bulldozing rendition of the (beyond) classic track Beyond Hypocrisy. 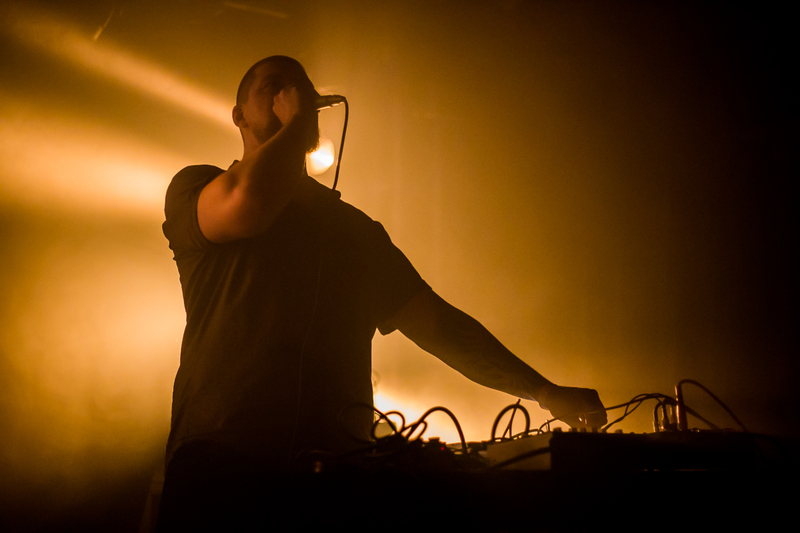 To take a brief step back, it was towards the end of the Zoät-Aon set that Dominik Fernow of Prurient walked through the crowd, tapped me on the shoulder and stated “victory through violence” with a sly smile before disappearing backstage. 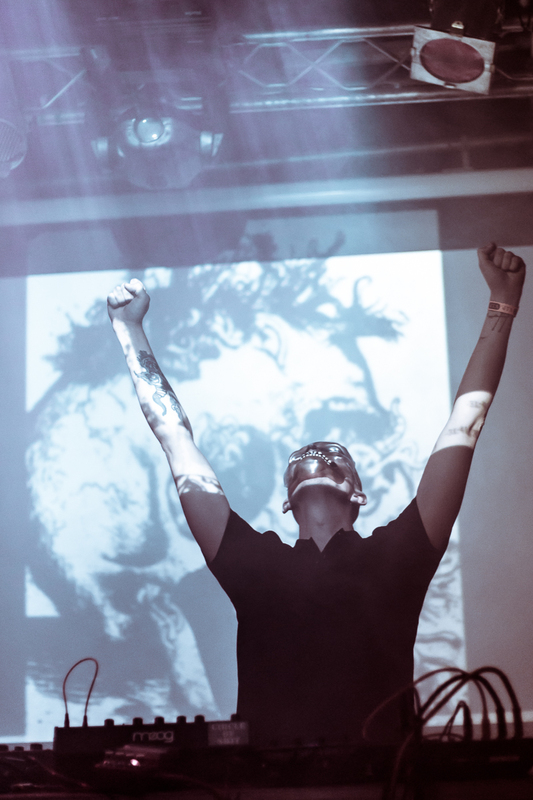 In this providing a vague indication of what was to come, indeed the expected classic Victory Through Violence was left until last, when Dominik Fernow then entered the stage and which injected an element of unbridled chaos into the show. 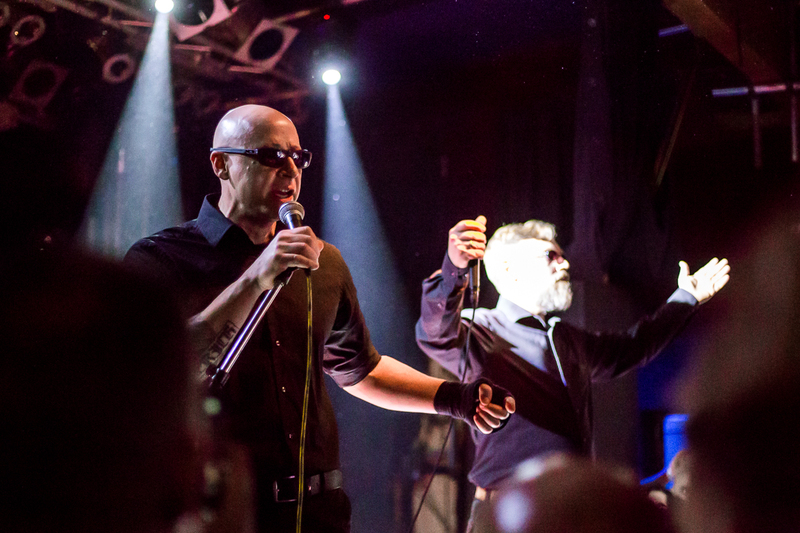 Although Dominik’s vocals were too low in the mix (or otherwise distorted beyond recognition? ), this made little difference to the immediate violent intensity and urgency he brought to proceedings as he lurched manically around the stage while bellowing viciously at the front row. 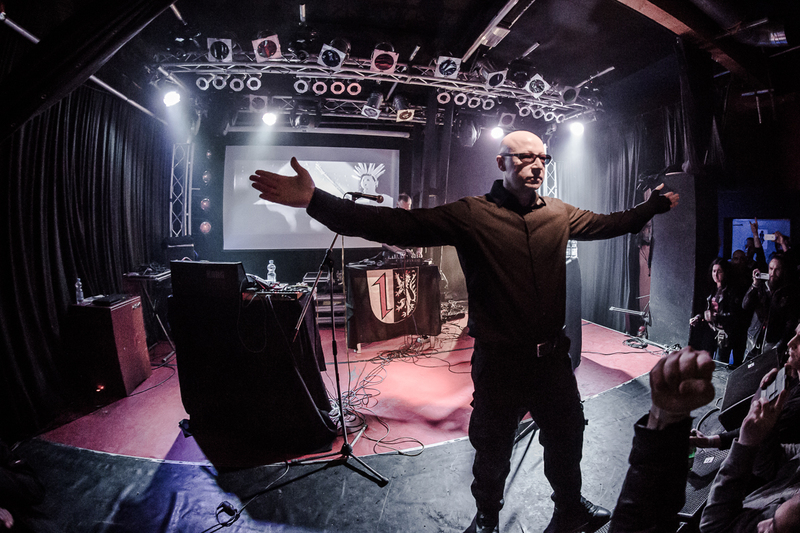 Later Dominik jumped down in the crowd which generated more crowd shoving chaos and when back on stage culminating in a smashed microphone and resulting in a raucous crowd response at the end of the set (…and resulting in another highlight in a collection of highlights). 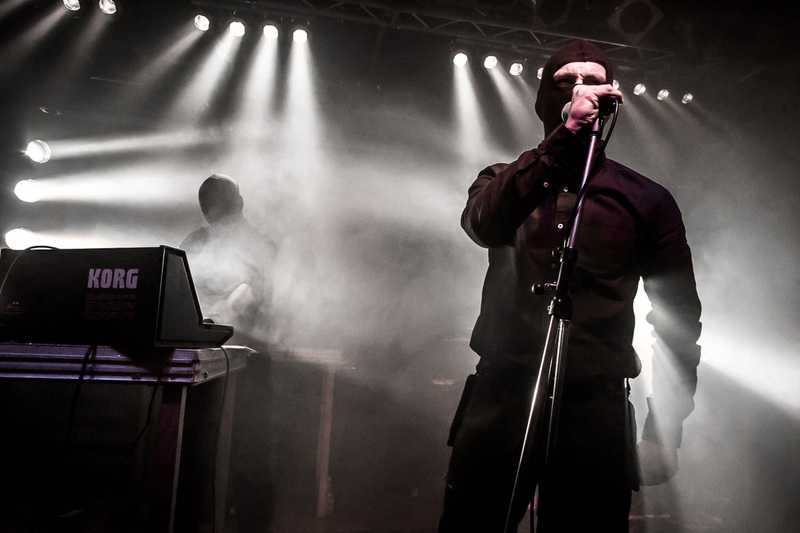 On record Post Scriptvm feature a particular blend of dark ambient and industrial soundscapes, so based on this, my expectations were for a subdued set from the group, but in the end this expectation was proved to be partially wrong. Stage wise a long table of equipment was manned by a male and female duo, and complimented with a video backdrop of black and white archival footage of various themes (medical experiments, implied torture/ execution footage etc.). 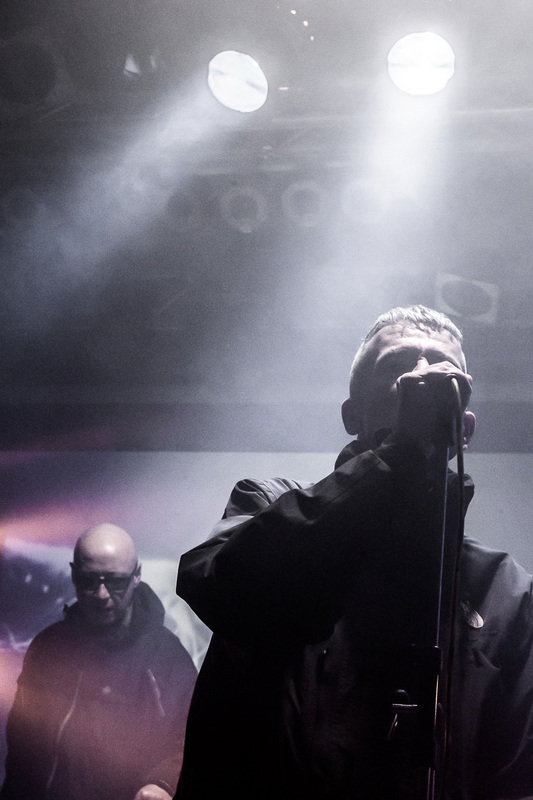 As for the set, it involved a selection of recognisable tracks lifted from recent albums, interestingly these has been pushed towards heavy electronics intensity, particularly when the male of the duo stalked the front of the stage to deliver distortion treated aggressive vocals. Likewise the later half of the set was quite hard and sonically forceful, but also maintaining meticulously sonic detailing such as the project sounds on record. Perhaps less visually engaging and with less of an overt stage presence, it allowed the music to be the central focus of the performance and was ultimately a strong and enjoyable set. 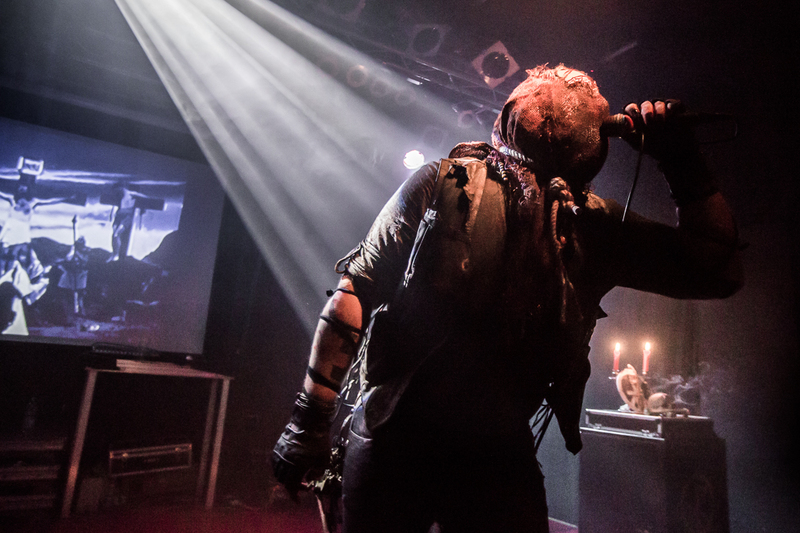 Moving on to Trepaneringsritualen, solo member Thomas Ekelund entered the stage flanked by a makeshift altar of candles, incense and skull. 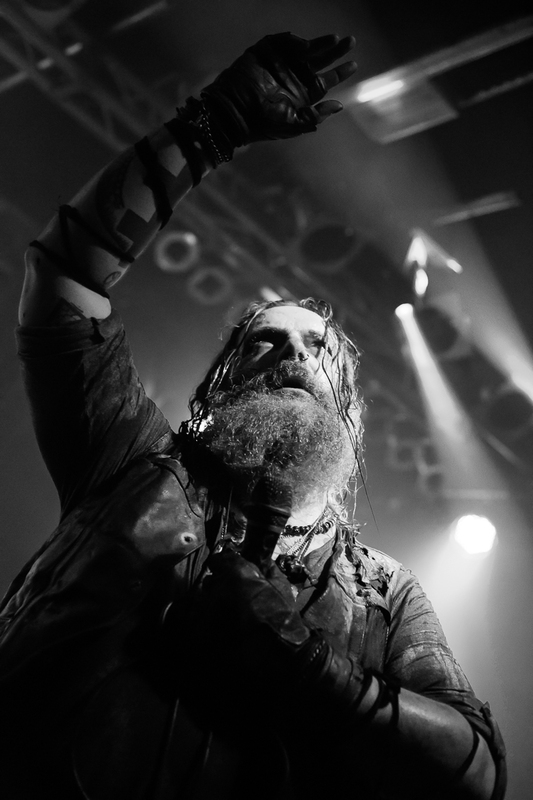 Thomas’s quite imposing stage presence was made more-so by the fact that his clothes were effectively rotting into rags, coupled with the blood soaked burlap cloth covering his face and held in place with a hangman’s noose. 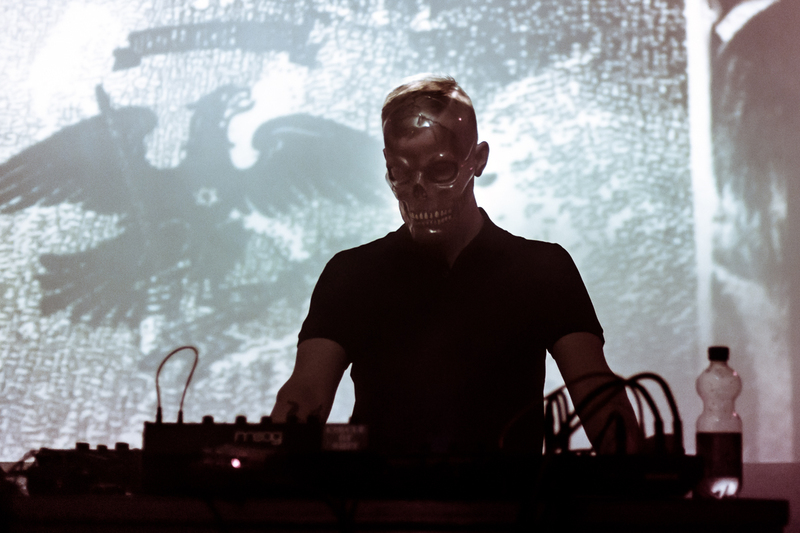 With the smell of incense coupled with the wafting stench of old blood, it functioned to amplify the ritualized setting, while the performance itself was based on live rasping and garbled throat driven vocals set to a pre-sequenced backing track. Additionally the purposefully stuttering black and white backing video also elevated the occult context. 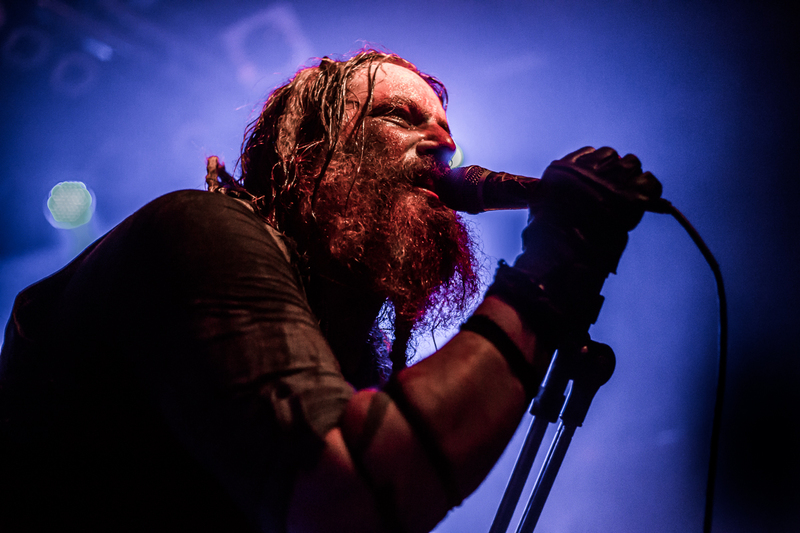 Effectively playing the new album in its entirely (which at that point I had not yet heard), the mood was a heavily rhythmic and driving ritualistic affair. Additionally a few noted classics like Judas Goat and Papal Pretender, which also followed the pattern of thundering drums of doom and the verse chorus verse format of the majority of tracks. Thus with the percussive driving nature of the majority of material, Thomas was able to build the intensity of the show to fever pitch over its duration. Based on the rhythmic song format and elevating intensity and mood of the set it is easy to appreciate that Thomas is making inroads into other underground scenes outside of the usual industrial one, but with the raucous applause at the end of his set, it was easy to see he had won over the majority of the audience on the night. 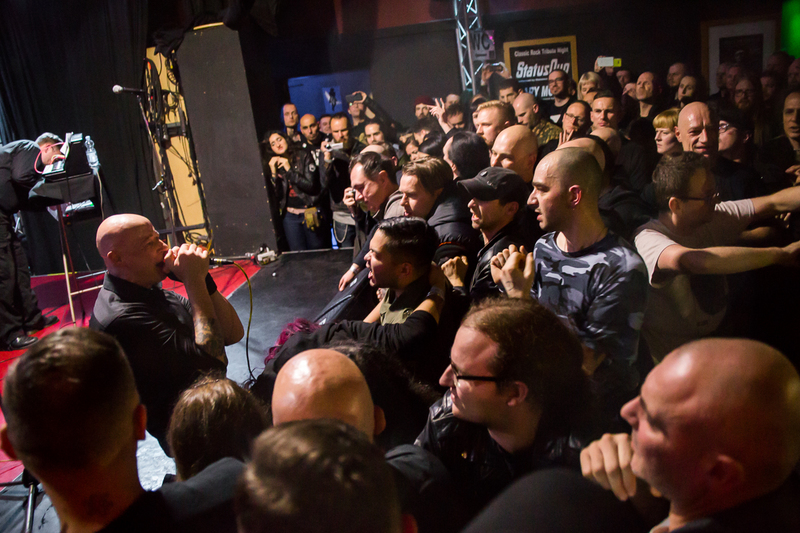 As for the headline slot and final act, the hard-men of Mannheim Genocide Organ were left to close the festival and once the curtains were drawn back they looked completely in their element in knowing exactly how to use the club’s PA to maximum effect, and like headliners Anenzephalia the night before there was a noted step up in volume and bass punch. 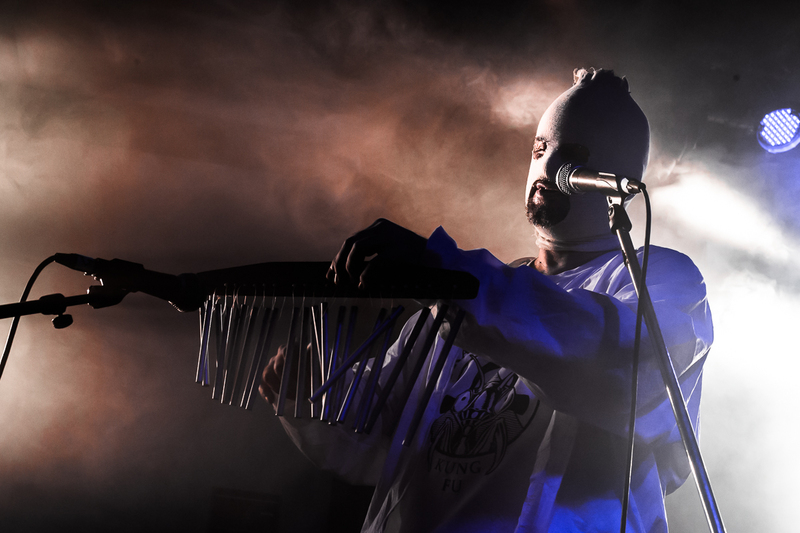 With Genocide Organ’s usual approach of presenting highly specific concept shows, what was on display tonight was a performance without props, masks or special noise implements etc., but more of a straight forward set which drew from their extensive back catalogue. But even with the ‘back to basics’ approach, a video visual backdrop was used to support the chosen set list, where it could be noted that the utilised news reel and war documentary type visuals specifically supported each individual track. On stage D.A.X. 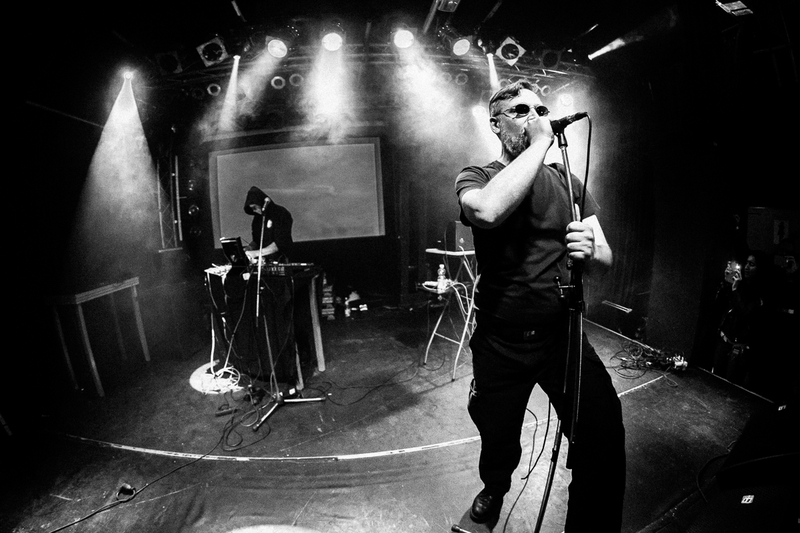 and Doc.M.Riot manned their noise equipment up the back, while Wilhelm Herich and Brigand Moloch manned their own noise equipment up front and either individually led or shared vocals depending on the track (although Wilhelm Herich also had a larger overall front man role). 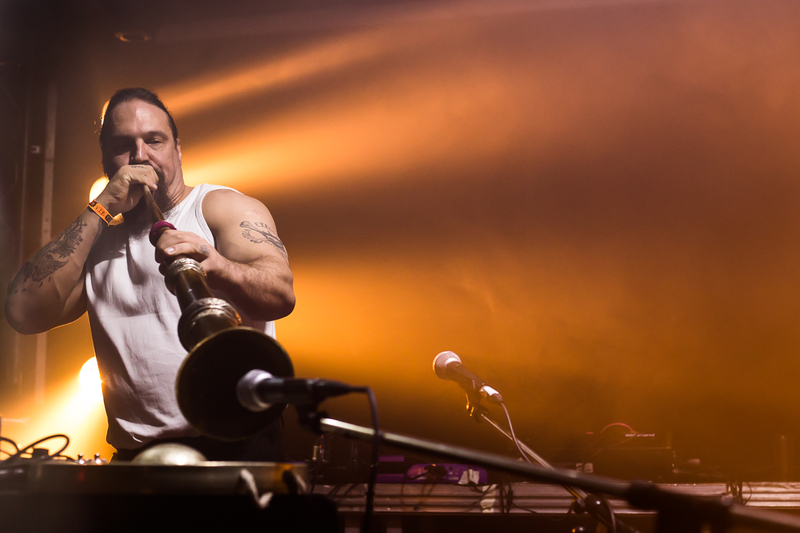 In pulling no punches the group launched into a blistering version of Viva La Guerre to set a punishing tone. Early on this was followed by a track from the 7”EP released at the festival, as well as The Tears of My Soul from the Juche comp. The aggressive atmosphere was then elevated further with a hammer blow version of Autodefensa, and while I don’t know if it was due to partial jet-lag and the surreal feeling of actually being in the audience, but at that moment I was completely overwhelmed by disbelief at the sheer totality of the festival (i.e. simply monumental!). To also mention other notable standout tracks in the set-list these included: Hail America, Its Over, I Don’t Wanna Die and Denard. Also at one point late in the set a couple of people attempted to drag Brigant Moloch offstage when he got close to the stage edge, but with those aggressors being unsuccessful in their attempt, they were duly chided by his iron glare. In perhaps loosing track of time due to my total immersion in the performance, in what seemed to be a far too short space of time the show was over, and concluding with the short, repeated dialogue sample based track Prince from In-Konflikt, which stated: “I believe we acted appropriately at all times”. Based on the jaw-dropping sound and commanding stage performance from the group, the crowd reaction was understandably over the top, but despite such demands for an encore none was forthcoming. As a final comment, despite Genocide Organ’s set being easily the standout performance of the festival, at the conclusion of the second night, I was still left quite astounded by the monumental quality of the overall event given how strong all projects and individual performances were over the course of the two nights. Certainly some fantastic performances and significant memories to savour for some time yet. Given Tesco’s established track record of putting on now legendary festivals, admittedly I had extremely high expectations, but in the end those expectations were completely obliterated by how amazing the event was overall. 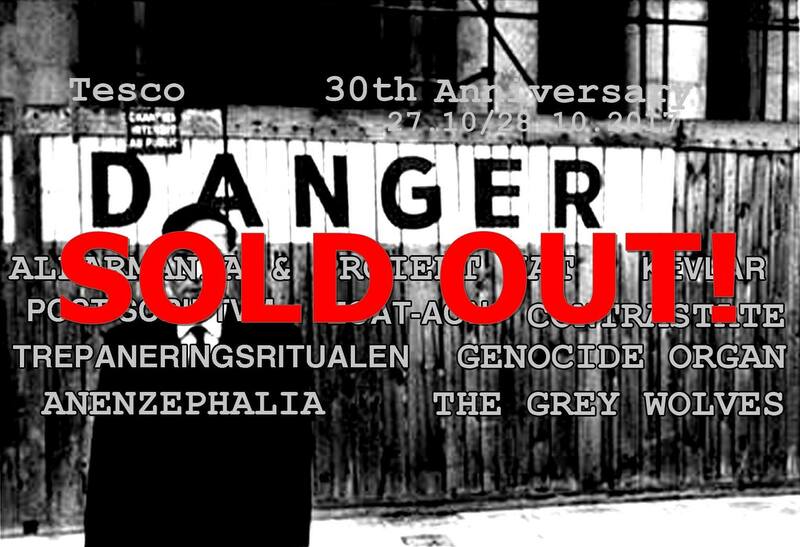 While I may not have been to a huge number of European shows compared to other attendees, I have still managed to get to 6 major underground industrial festivals in Europe and the UK since 2001, but in comparison to those Tesco 30th is by far the pinnacle of anything I have attended previously. With only four acts on the first night and five on the second night, this provided for ample set times for each and made sure the running of the event never felt forced or rushed. 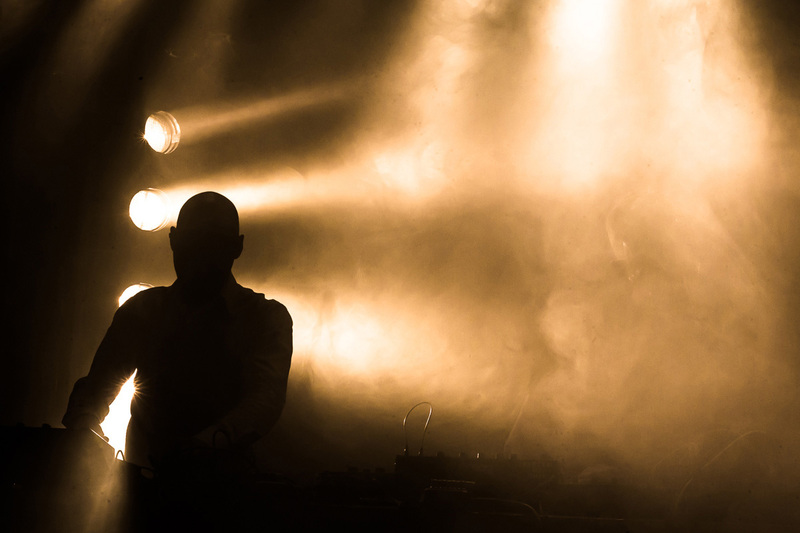 This likewise provided the opportunity for full attention to be paid to each act (and ample reflection time between acts), rather than the potential fatigue which can set in from simply seeing too many acts on the single bill. To speak of personal preferences, with the group selection on the bill being so aligned with my long term listening habits (and that I already follow all groups outputs), it is an extremely difficult task to pick favorites as they were all so strong in their own way and approach and clearly gave their absolute all when gracing the stage. But if forced to do so, my personal favorites across the event were Kevlar, Alfarmania:Proiekt Hat, Anenzephalia, Zoät-Aon, Grey Wolves, and of course Genocide Organ. Clearly the caliber of the venue’s sound and lighting and the quality of the performance of groups was instrumental in creating such an amazing event, but the role of Tesco and assisting individuals in curating the bill should not be underestimated. 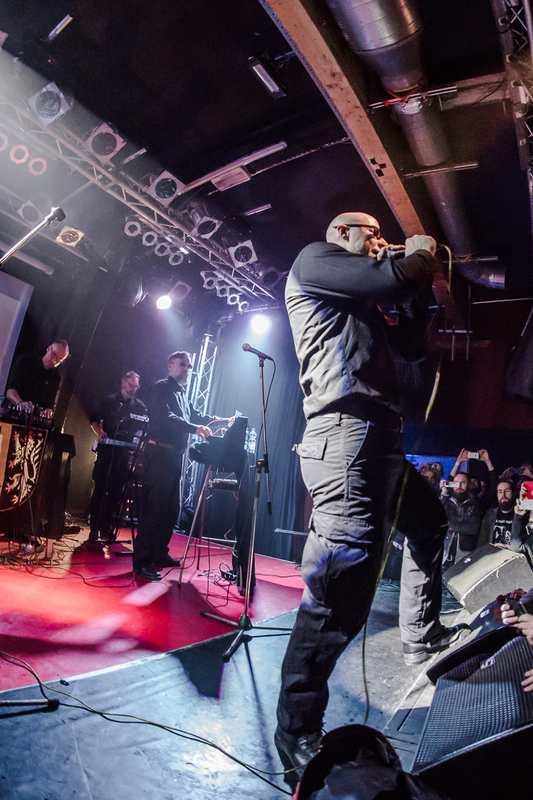 The project selection was essentially flawless by picking a selection of artists with a wide diversity of sound and approach while also being highly coherent within the underground context, and which was clearly strong enough to attract so many underground industrial fanatics from across Europe, North America and Japan. While it is hardly appropriate to already to start to talk of Tesco 35th – I can only hope it will eventuate in half a decade’s time.